This item is an online promotion and not displayed in the store at this time. All of our products are sold exactly as described and sold with money back guaranty. Please note that the order time is 10-15 business days from the invoice date for either pick up in the store or for delivery if requested for a fee. Availability is a subject to change. Please check on availability before ordering. 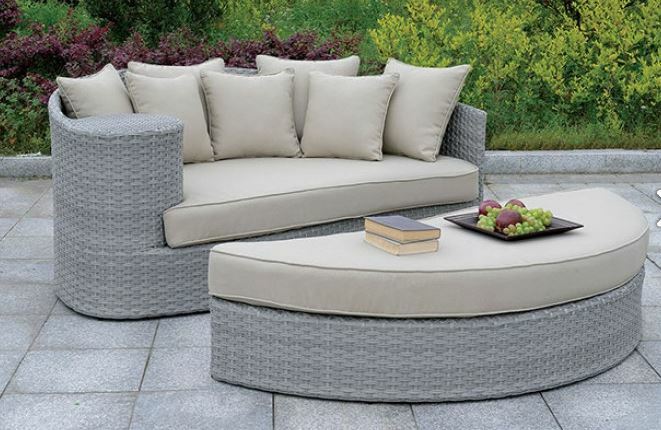 Transform your outdoor living space with the comfortable versatility of this contemporary patio set. 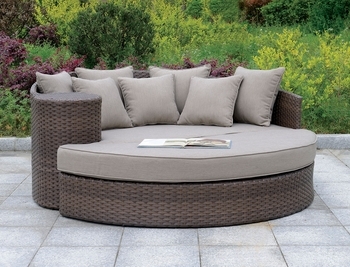 This plush design will encourage you to practically live in your backyard! The convenient circular design multifunctions as a table or footrest, its curved shape making it accomodate your needs with greater ease. The aluminum frame gives it a strong base while the fabric cushions and loose back pillows offer the softest comfort imaginable, providing the perfect surface to relax in your backyard haven!